Bloomhill Cancer Care urgently needs 3000 more signatures on its petition calling for the Queensland Government to save its full range of cancer-care services on the Sunshine Coast. It only takes one minute to complete the Save Bloomhill Campaign petition, via https://buff.ly/2SbTtGw. Bloomhill is a centre for excellence in integrated cancer care which supports more than 1200 patients a year and employs 47 staff. It is operating at a loss of about $200,000 annually and could be forced to cut staff and services unless it receives urgent State Government funding. The centre offers vital community services such as a volunteer transport, shopping and buddy service, through to expert allied health multidisciplinary services such as exercise physiology, dietetics, psychology and occupational therapy. Join Chris Franck, CEO, Bloomhill Cancer Care and Ted O’Brien MP, Federal Member for Fairfax, by please pledging your support and adding your name to the petition! 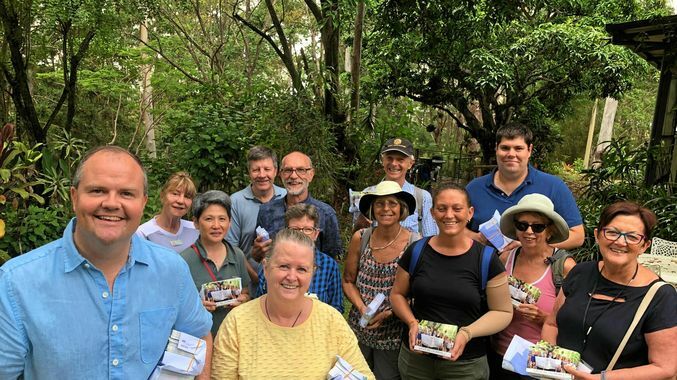 Chris, along with Ted and volunteers recently conducted a letterbox drop to thousands of homes across the Sunshine Coast (pictured). Photo courtesy of the Sunshine Coast Daily. This entry was posted in News and tagged allied health services, Bloomhill Cancer Care, cancer care, Community, Funding, health, sunshine coast, Ted O'Brien.